Welcome to the Global Professionals! 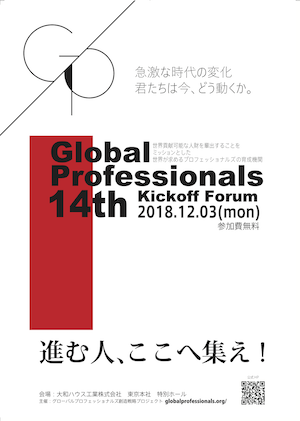 Since established in 2005 in Japan, the Global Professionals has engaged many famous outstanding lecturers from various fields and has been supported by many global companies, including Shiseido for whom Mr. Manabu Yamamoto, the President of the Global Professionals, has served over 40 years as a consultant. Now The Global Professionals is seeing 10th anniversary in 2015, and the graduates are active all over the world and they encourage each other to achieve their goal, hoping to contribute to the world as one young member. Born in Osaka. Worked as Global marketing professionals for 40 years. Regardless of category of business or operation, conducts building management and sales strategies for manufacturers, wholesale and retail distributions and implements an outstanding corporate training to lead the company to success. In early 80’s, promoted a system that matches the coming of the advanced information technology society and received high acclaim. Recently, serves as Chair, Asia Pacific Management/Marketing Institute, China Liaoning University Graduate School of Management, and works hard to serve and insistence and severe enlightenment guidance to educate the younger generation in the world especially focuses on East Asia. The Market is moving at a very high speed. It is beyond the level of just adjusting to change. In the past, I have been impressed by Mr. Palmisano’s report, who was the CEO of IBM in the USA. The report asks, “What we should do as older people, knowledgeable-people, or business people for those who are younger, as well as their descendants who will build the future of the world?” I understood his message to be an admonition for all people teaching in society, and also as a warning. The market and society are moving without stopping. There is a whirlwind of innovation moving not only at the global level, clearly felt by all people living on this planet. Under these conditions, we should recognize the following as the most important topics for all people living in this age: 1) The creation of global perception, 2) taking on the challenge to push the boundaries of every field, 3)social media marketing, 4)the development of perceptive human character , and 5)the growth of both common and good sense . Also, we need to make efforts for them to be realized. That has led me to start the Global Professionals, the Strategic Project for creating Globally Qualified Professionals, and now in its 9th year. Graduates from the 8th year are spending their efforts either by starting new enterprises or in contributing to the companies to which they belong. I am confident that each new creative activity proves the necessary value of the existence of this school, and I am full of thanksgiving, joy, as I have greater expectations for the future of the school. ◆ Any male or female up to the age of 45 are qualified to apply, but will be examined by each profile. ◆ Admission is totally FREE, however, all participants will be charged at the convivial party followed by each lecture.